With that, the crumpled android falls still, never to move again. So ends the tutorial of A Robot Named Fight, and so begins the ever-changing retro adventure. A Robot Named Fight tells the story of an everybot on a mission, fighting the looming threat of meat under the moniker Fight. Set in a fascinating, futuristically-retro society of sentient robots whose gods have recently ascended from them, the game takes the “human-society-overrun-by-artificial-intelligence-apocalypse” trope and turns it on its head. A large mass of flesh floats over the city one day, chomping at the air with its monstrous mouths and scaring and scarring all beneath it with its numerous exposed reproductive organs. Armed with a blaster and the task to gather power-up artifacts, Fight explores a procedurally-generated labyrinth of underground catacombs to make their way towards the Megabeast, dispatching the chunks of meat they come across on the way. The quality of this game goes well beyond its unique spin on a classic storyline; the scene it sets is truly what makes this game something special. In an era of gaming wherein nearly everything is almost pointlessly high-definition, there is a fine line between looking retro and looking lazy. This fact, while true, has nothing to do with this game, as that line could not have been any further avoided. The beautifully-macabre catacombs instill a strong sense of nostalgia that is hard to shake when combined with its invigorating soundtrack and perfectly-matched effects. The game could be presented in an arcade cabinet and never once have its status as a 20th-century classic challenged. The new standard of “easy to play, hard to master” could not be better represented by this game. Gameplay is simple enough to pick up quickly, yet challenging enough to keep you playing for hours. The new standard of “easy to play, hard to master” could not be better represented by this game. Fight’s flesh enemies are far from challenging as you make your way towards them; even the sturdiest foe is downed in no more than three basic shots. Despite this, players can sense their skills growing with each run, as they discover new power-ups, enemies, strategies, and — given that the maps are randomly designed each time the start button is hit — new pathways and challenges to follow. In fact, the farther along you get, the more of these you can unlock. New elements are added into the mix based on your progress, so the more times you play the game, the more each playthrough is going to evolve. It’s important to specify that it changes with, not during, each playthrough, as you are going to be racking them up. The game features a true permadeath mechanic which, while admittedly frustrating, raises stakes and adrenaline to all-time highs. One of the unlockables as you progress may be single-use checkpoints, but the overwhelming knowledge that all of your remarkable progress will be gone as soon as your health bar disappears can bring a new level of stress for which you might not have been prepared, going into the game. A Robot Named Fight has more than enough going for it that its shortcomings are completely overshadowed, but they are still not altogether erased. After roughly five minutes of running through the maze, you reach the Big Boss that everything has been leading up to. This is where exploring around the maze rather than just attempting to rush in pays off, as without picking up enough of the artifacts, the boss is barely manageable. After the mostly one-note fight comprising of having the meatslab walk towards you and then throw smaller meatslabs in your direction, you are met with the revelation that this was not, in fact, the Big Boss mentioned in the introduction, and the game has far more in store for you. After this point, more and more is added into the game. 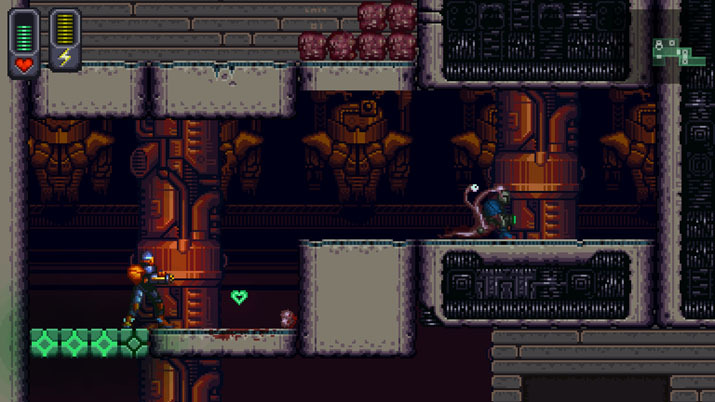 You go deeper into the catacombs, finding fellow robots that can offer you goods in exchange for valuable artifacts, upping your combat skills to ready you for what lies below. A Robot Named Fight has more than enough going for it that its shortcomings are completely overshadowed, but they are still not altogether erased. The keyboard controls are not quite standard and wind up being relatively difficult to keep track of. 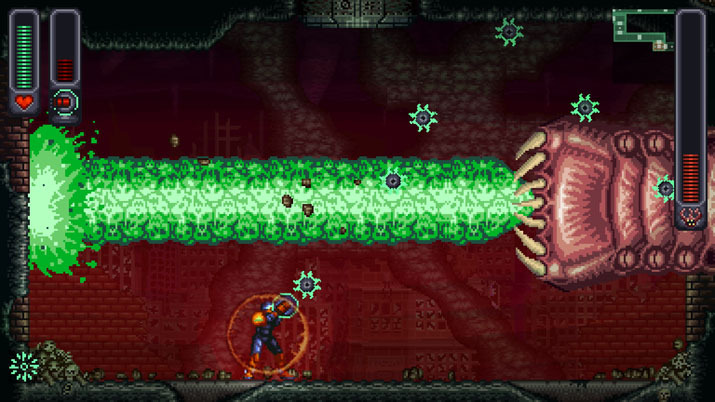 The game does begin with a strong recommendation to use a controller when playing, which did result in a better overall experience, but these are not always available. Additionally, while making your way through the catacombs, you will be hard-pressed to run for more than a minute without finding yourself at a dead end with nowhere else to go. The answer to this problem is to shoot at the walls around you, as often they will crumble away and offer you a passage that had previously been invisible. While a fun mechanic in theory, the majority of these destructible patches of wall are minimally marked — when they are at all. Without compulsively shooting at every brick you see, it can be difficult to know precisely what the game is asking of you, which can destroy you if you are playing with an eye on the timer.